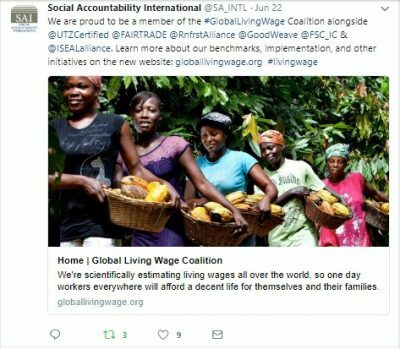 Social Accountability International is a NYC based nonprofit that owns the SA8000 standard and pursues other initiatives to enhance and empower management systems of facilities often found in the supply chains of large brands and industries. The SA8000 standard is something that apparel, machinery, and other facilities hope to be certified to in an effort to pursue socially compliant business, and create a safe work environment for their employees. Individual facilities can adopt this standard, or brands and companies can accept the SA8000 as the standard to utilize in their business. 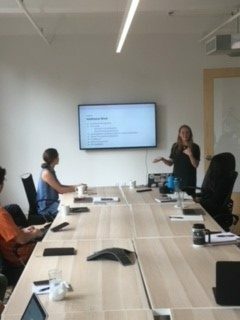 Different brands like Disney and Eileen Fisher work with the SAI team to conduct specialized workshops and trainings related to SA8000 and other SAI initiatives. 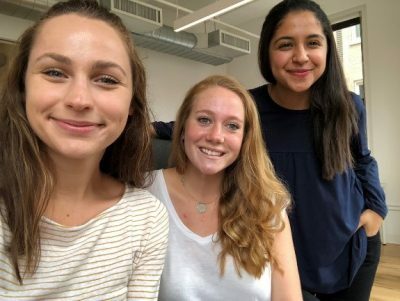 While working at SAI, I spent my first week immersed in understanding the company’s different departments and its greater role in the world of corporate social responsibility. SAI did a great job familiarizing us with their different departments and ongoing projects. Along with myself, there were also two other interns, both undergraduates at Wellsley, pictured here. Following our immersive first few weeks, it was time to pick our projects. When my internship began, I was working on 3-4 projects, but many different projects arose during my internship that I was a part of. In total, I had worked on nearly 10 different projects! These were all in the departments of Strategic Programs, Standards & Impacts, Corporate Programs, Communication, and Training Departments at SAI. During my time at SAI, the Association of Professional Social Compliance Auditors (ASPSCA) established competency framework for social compliance auditors to be tested and accredited on. My largest project at SAI entailed comparing SAI’s Basic Auditor Training Course to this competency framework and assessing whether SAI’s course covers all that APSCA would test for. This project worked across several departments and required communication with the CEO and other outside stakeholders engaged with the company, as well as collaboration with the other interns. In my time at SAI, it became increasingly clear how far ranging and wide corporate responsibility has become. This field has become encompassing of many different initiatives and elements and encourages innovation beyond social compliance auditing. While at SAI, I was able to speak with the organizations founder and former CEO, Alice Tepper Marlin. She expressed to us that this work was some of the first of its kind when established in 1997, and nearly 21 years later, continues to pursue and engage with organizations breaking the ground at different levels. SAI has been at the forefront of creating safe workplaces throughout the world, and my time here highlighted the larger risks that varying groups of people are vulnerable to through poor work practices and conditions. While at SAI, I engaged with varying levels of individuals in the company and outside of it, including board members and experienced social compliance auditors. My internship challenged me in fulfilling and productive ways which allowed me to feel like a professional and a student at the same time. New York City provided a great backdrop for hard work, and I hope to return permanently one day. 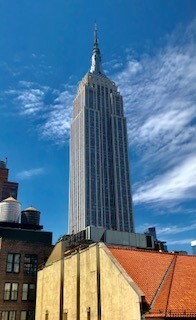 Pictured below, you will see our vantage point from SAI’s office window: an incredible view of the Empire State Building. I am incredibly grateful for this opportunity provided by the Human Rights Institute and Social Accountability International and would recommend it to anyone interested in learning more about the CSR and Human Rights field. Please reach out if you have any questions or are looking to pursue this opportunity!